Chronicle, directed by Josh Trank (Kill Point) and written by Trank and Max Landis (John Landis’s son) more-or-less follows Andrew Detmer, a high school senior who’s going through some issues at home — his mom is sick, his dad is on disability, and he’s not really liked by anyone except his cousin Matt Garetty. Andrew decides one day to start filming everything that goes on in his life, and it’s through this that we see his father’s issues with drinking and physical abuse, but it’s also a way into Andrew and Matt’s world. One evening, Matt convinces Andrew to go to a party. Andrew brings his camera, which gets him made fun of and spit on, and he eventually sits outside by himself. That’s where Steve Montgomery, one of the popular kids, finds him. Steve and Matt found something, and Steve needs Andrew to come and videotape it. “It” is some sort of alien debris down a deep hole. Steve, Matt, and Andrew are affected by it somehow — they don’t know how at first — and they barely manage to escape. But it’s soon after that they realize they’ve got telekinetic powers. High school seniors. With telekinesis. What could possibly go wrong? From there, the story progresses pretty predictably — one of the friends uses the power for personal gain, one of them uses it to help others, and one uses it for more unpleasant purposes. But when one of the friends is killed, the other two have to figure out what to do with their powers. Chronicle stars Dane DeHaan (In Treatment) as Andrew, Alex Russell (NTSF:SD:SUV) as Matt, and Michael B. Jordan (Friday Night Lights) as Steve. I totally bought into the three of them in their specific roles, although really I didn’t come into the film with extremely high expectations, so it wouldn’t have taken much to impress me. I do think DeHaan and Russell played off each other well in the battle scenes. And speaking of battle scenes… remember how, in Man of Steel, basically the entirety of New York City is destroyed in the Superman/Zod fight? Well, Chronicle takes place in Seattle, and when the hero and villain finally have their superpowered fight, there’s quite a lot of destruction. It’s almost too much — mostly when they’re bashing against and through various buildings in downtown Seattle. I get that the villain is pretty powerful, and pretty upset, but his power level went up really quickly. Directing a found footage film is a bit weird because every scene has to be written and blocked from the POV of a camera. That leads to challenging angles and weird decisions, such as filming a major action moment through a security camera filter or giving one of the characters the ability to telekinetically have the camera follow him. And then there were the times when the camera got knocked in mid-air and spun around. I imagine on the big screen that was nauseating. I will say that, in the final battle, Trank’s direction and Elliot Greenberg’s (Clerks 2) editing was strong enough to support the conceit that was a found footage film — police cars, television cameras, security cameras, helicopters; all of it went into crafting a scenario that, after a while, I stopped noticing was found footage in the first place. Which, I suppose, is the point. By the time the hero defeated the villain, I didn’t even care where the footage was coming from. 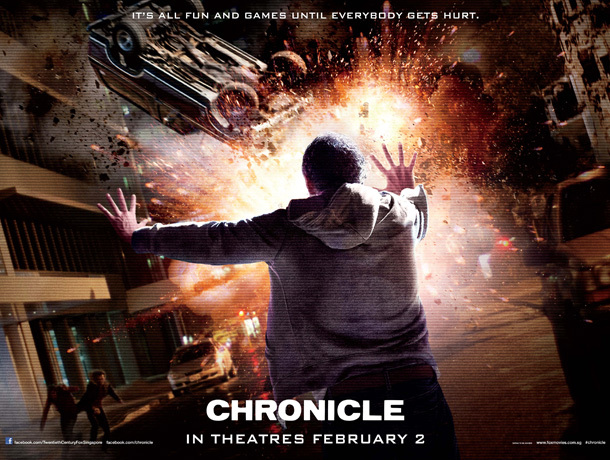 I found Chronicle to be a pretty strong entry in the superhero film genre. Once you get past the found footage gimmick, you’ll find a story about three teenagers who gain superpowers and behave just about exactly like you’d expect them to. Which is, in and of itself, a different way to look at the material. And that’s more than I got from Man of Steel.